Are you embarrassed to smile because your teeth are dingy, yellowed, or streaked with stains? If so, the dental care professionals at Fine Dental can illuminate your smile, restoring it to its natural beauty and luster. Through teeth whitening treatment at our Manhattan, New York cosmetic dentistry practice, Dr. Fine and Dr. Salehezadeh can dramatically whiten and brighten your smile in as little as a single appointment. Instead of covering your smile every time you speak to someone you meet or feeling self-conscious every time you laugh, take that first step toward a smile you'll be proud to flash by contacting Fine Dental today! Using powerful whitening agents that are peroxide based, our dentists can penetrate deep stains, diminish yellowing, and whiten the natural pigmentation of your enamel. 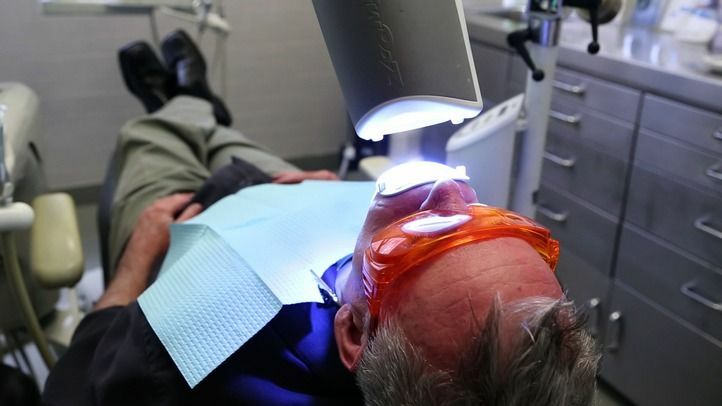 While there are a variety of over-the-counter teeth whitening products on the market, our Manhattan, New York dentists recommend that you undergo doctor-supervised treatments so you can achieve optimal results with minimal risks. For your convenience, Dr. Fine and Dr. Salehezadeh offer both in-office and take-home ZOOM!® whitening treatments. If you choose to whiten your teeth at home, our team will take an impression of your teeth, craft a customized tray from the mold, and then educate you on how to administer the bleaching agent. In the luxury of our office, your smile can be whitened up to eight shades in as little as a single treatment. Because all of our whitening treatments require the use of a customized tray, the chances of over exposure to your gums is reduced. Our team skillfully applies the mixture to the surface of your teeth and monitors the progression of your treatment. However, if you choose to undergo treatment at-home, our dentists will require you to attend follow up appointments so they can observe your progression. Teeth whitening can be used in combination with several other general dentistry, restorative dentistry, and cosmetic dentistry services to enhance the overall aesthetics of the smile. Treatments are safe, effective, and extremely convenient. Teeth whitening treatments are affordable and the results can last for weeks, months, or even years with proper maintenance. Teeth whitening is a non-invasive procedure that yields completely natural-looking results. Through teeth whitening treatments you can truly illuminate your smile. Contact Our Manhattan Practice about Teeth Whitening, Today! To learn more about teeth whitening, or to find out whether the cosmetic dentistry treatment is right for you, contact Fine Dental in Manhattan, New York today. Teeth whitening can make a dramatic difference in the appearance of your smile and significantly increase your self-confidence!